anneliese kliewer: the view from my window. sorry, folks. i took the easy way out. i didn't go outside & i didn't even get out my camera. just pulled up the shade & snapped a pic from my phone! i still wanted to commemorate. 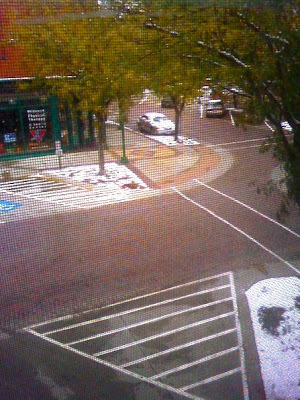 10.10.09. the first snow. ok, enough for now, back to changing out my tank tops for sweaters, cords for capris, & flip-flops for uggs. i love the change over of clothes! it gives you a whole new wardrobe! happy weekend! What is wrong with our lives...why don't either one of us get to enjoy a "normal" fall? Oh well...I bet you will have a beautiful weekend in Ponca! And really, neither one of us has terrible weather...just unexpected! i can't believe you have snow too! i saw summer's blog & was in shock! i am happy to say that the Mitten is still snow free! (thank you God!) i'm not ready quite yet!